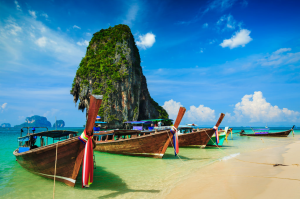 Thailand is a wonderful place to get away from it all for romantic getaways with a difference. If you are looking for somewhere exotic to enjoy some quality time with the love of your life, you are sure to find the dream destination in this gorgeous land of contrasts. Here are some of the most romantic places in Thailand to explore with your partner. Once the top destination for backpackers, this island paradise is now better known for its luxury resorts with modern flair. Where better to kick back and relax with your other half than in a beautiful hotel on the shores of a white sand beach? Take the time to explore the island’s gorgeous interior with its pretty rolling hills and coconut palms and then enjoy a couple’s massage at one of the wellness spas. This is the top honeymoon destination in Thailand and its easy to see why when you are enjoying a cocktail together on the balcony, watching the sunset. If you want to spend time in complete seclusion with your partner for some special one on one time, Krabi is the ideal spot. Just as beautiful as more well known resorts like Phuket but with a much less touristy feel, you should head to Railey Beach with its gorgeous rustic beach houses that can only be reached by boat. Glorious Chiang Mai brings lovers the best of both worlds. Its busy streets boast a vibrant life of their own, with beautiful temples to explore hand in hand and pretty boutiques where you can find the perfect gift to show your partner how much you care. Head a little further afield, and you can enjoy the romantic experience of riding an elephant and getting closer to nature as well as each other on a romantic Thailand getaway. The Thai people place great emphasis on courtesy and politeness. Many of their rules of etiquette stem from the Buddhist religion. 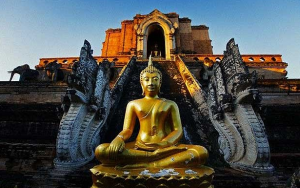 Some ninety percent of Thai people are Buddhist. In fact, openly criticizing someone is considered a form of violence. The “wai” is the traditional form of greeting given by a person of lower status to a person of higher status. Also, when Thai people refer to one another, they use first names rather than surnames. These first names are preceded by the honorific title “khun.” This title is appropriate for both men and women, and it is an all-purpose form of address. If you are a dinner guest at a Thai person’s home, take care to arrive on-time and also take notice if the host is wearing shoes; if they are not, you, too, should follow suit and remove your shoes. Speaking of dining, Thai cuisine is made from wonderful items like chili, lemongrass, galangal, lime leaves, shallots, mushrooms and a wide variety of seafood. A very popular salad is a spicy papaya salad blended with the eponymous fruit, shrimp, crab, garlic, green beans and a host of other items that come together making this a favorite dish. Coconut is a very popular cooking item in Thai food, and Tom Kha Kai (chicken in coconut soup), is made with chilis, crushed shallots, chicken and coconut milk. Gaeng Daeng (red curry) is another popular that utilizes another very popular ingredient in Thai cooking. Curry can be found in many dishes. 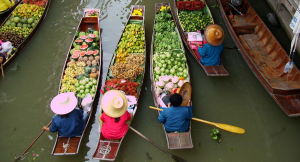 Fresh vegetables, fish and pungent spices are the hallmarks of most Thai dishes. Thailand was known as Siam, until 1939. It was again referred to as Siam from 1945 to 1949. This country, which is the biggest exporter of rice, also has a coastline that is over 3200 kilometers long. Their political system is akin to that of England as it is a constitutional monarchy. At one time, buildings in Bangkok were elevated on stilts as the city was filled with canals. Of course, during rainy season this could easily mean destruction of homes, but nowadays most of the canals have been filled. It is illegal to step on any Thai currency, to drive shirtless, and it is also illegal to leave your house without underwear on! A few things to bear in mind if visiting! © Copyright www.housethai.com.au 2019. All rights reserved.